As part of its new, healthier, turned-around face, McDonald’s added kale to its menu last year. Frankly, the rollout’s been sort of noncommittal so far — tests started in the safest place possible (SoCal), and content-wise, it’s just a smattering of the superfood in a breakfast bowl. But in Canada, there’s already a line of kale salads on the menu. Customers looking to avoid a gut-busting large fry can instead nourish themselves on the “Keep Calm, Caesar On” chicken salad: a “nutrient-rich” mix of baby kale, bacon, Parmesan, and croutons. The problem is that it’s not very nourishing. 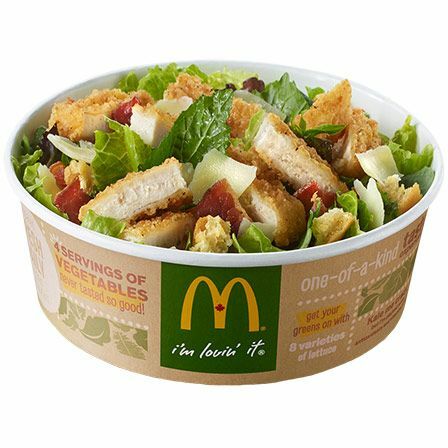 Once the Asiago dressing gets added to the “crispy chicken” version of the Caesar, the salad grows to 730 calories, 1,400 milligrams of salt, and 53 grams of fat. “You’d have to chow down three traditional McDonald’s hamburgers to consume about the same number of calories,” explains the Canadian news site CBC, which crunched the numbers. A more heart-stopping comparison can be made with the Double Big Mac — a Canada-only monstrosity with four burger patties that, in this context, contains a paltry 680 calories and 38 grams of fat. Worried dietitians up north are advising Mickey D’s customers to do health hacks, like subbing in the least caloric dressing, and then only using half of it. People who get the “I’m Greek-ing Out” grilled chicken salad, because it’s ostensibly the menu’s healthiest kale option (420 calories, 1,080 milligrams of sodium), are still told to consider yanking out the feta crumbles to rein in the salt content.